"Did you know, the world first met The Very Hungry Caterpillar in 1969?! 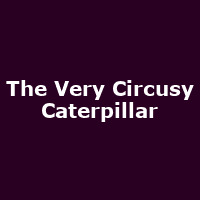 The Very Circusy Caterpillar is a little cheekier, a lot more peckish and much more circusy! Inspired by this classic children's storybook, this fun and interactive show sees our ravenous friend take to the stage to juggle plums, hula-hoop fruit and tell a few silly stories that will have your little one in fits of giggles. It's the perfect show for your child's first experience of live performance and is sure to induce a little nostalgia for the adults."